AMPEX, TEAC, AND SONY, WERE THE MAJOR PLAYERS IN THE HOME REEL-TO-REEL TAPE RECORDER MARKET. HERE ARE A FEW OF THE MACHINES THAT WERE TRYING TO GAIN A FOOT HOLD IN THE MARKET BUT DID NOT SURVIVE. 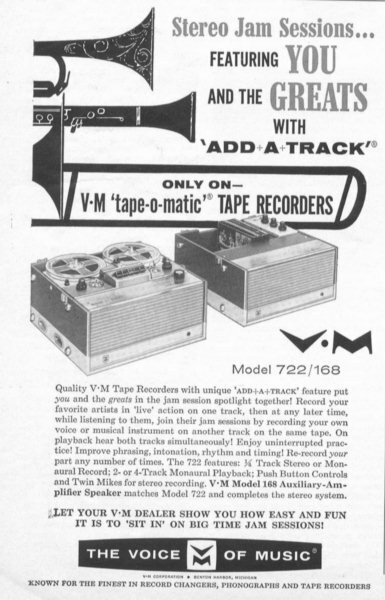 EACH WAS AN UNIQUE APPROACH TO THE TAPE RECORDER AS A SERIOUS PIECE OF AUDIO REPRODUCTION EQUIPMENT, AND SYNCHRONIZATION AND STEREO WERE A NEW THING! 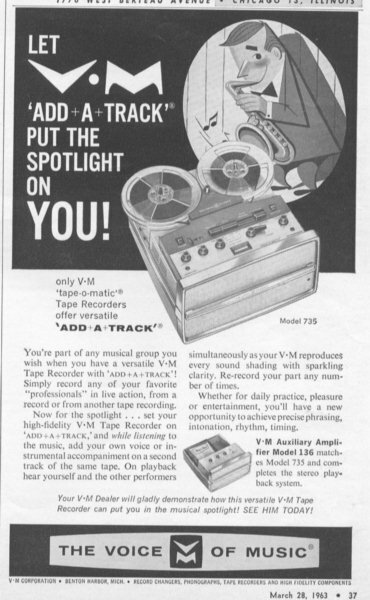 1-1962, "VOICE OF MUSIC"/ 2-1963, "VOICE OF MUSIC" recorders, introducing the "add-a-track" feature which was also known as "sound with sound". 3.-1965 "VIKING"-This machine had a good reputation and specifications to match. 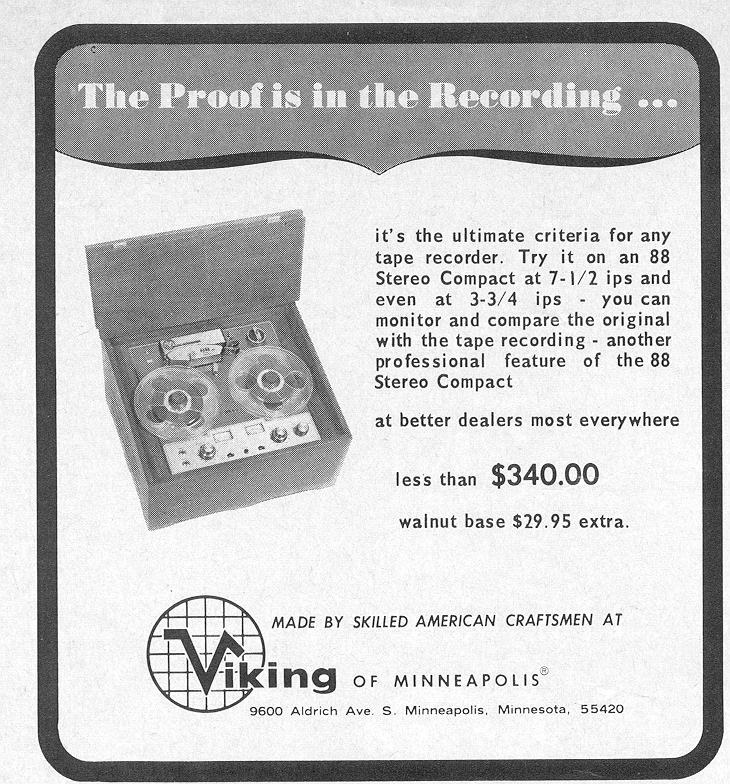 This early machine was one of the first to incorporate a second playback head to monitor the recording directly off the tape as it was being recorded. / 4-Tapesonic. / 5-Magnecord, Lafayette RK 880, Epic RC100. 6-Magnecord. Considered a good quality machine. 7-Heathkit. An amazing company that sold "kits" of their product. A person could assemble the pieces and have a high performing amp, tuner, Recorder or pre-amp. I recalling seeing Heathkit pre-amps connected to sound studio systems. These were very rugged, high performance specifications, at very low cost. Like the Volkswagon "Beatle" of the Audio World. 8-Korting TR/4000, Newcomb TX-10-4, Norelco 201, Norelco 150, an early portable cassette model. / 9-Uher 9000. 10-Panasonic RS780, Revox G36, Roberts 1725-8L includes a built-in 8Track cassette copy machine. Rare. 11-Viking 87, Viking 96/RP10, Sony 350, Wollensak4100 cassette recorder. / 12-Tandberg 12, a Swedish company, Uher 7000D, Sony660. 13-Tandberg64X. / 14-Roberts770. This 1967 machine was very similar to the Akai which came a few years later. Perhaps they are the same company. 15-RevoxMk3. A British machine known for durability and quality. / 16-Viking Model 88 stereo, 880 Stereo portable, 807 "Tape Turntable". 17-NorelcoTape Heads / 18-OKI 300 Recorder.